Contact Shamrock Heating and Cooling, your trusted Chicagoland source for world-class air-conditioning, heating and home safety solutions. Shamrock Heating and Air Conditioning puts our customers first every time, delivering a greater standard of excellence. Our priority is to enhance your family’s comfort, health and safety through high quality heating and cooling products, superior technicians and innovative technology. Not all heating and air conditioning companies are created equal, especially in Illinois. Unfortunately, the State of Illinois does not mandate or regulate any technical skills or aptitude testing for HVAC technicians that enter your home. That is why Shamrock takes great pride in our Factory Certified Technician Training Program. 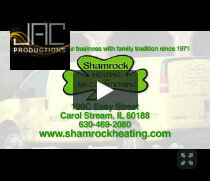 Call Shamrock for all of your heating and cooling needs. You can rest assured when we arrive at your home, you will receive the best technician in the County, if not the Country. Our full fleet of trucks are fully stocked to service any and all manufacturers of HVAC equipment. Every Shamrock technician has been trained to use, and carries with him, a high-tech Infrared video inspection camera. This camera allows the technician to spot any hard-to-find issues that you might be having with your furnace, air conditioner or water heater. It enables our technicians to diagnose the problem, quickly and correctly, and allows them to show you the problem so you can see it yourself. 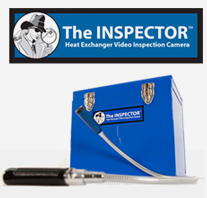 The Inspector infrared video inspection camera allows our technicians to make sure that your furnace does not have any holes, cracks, rust or corrosion damage inside your furnace. By using this camera, we can give you the peace of mind in knowing that your furnace is safe for you and your family. Shamrock installed a Trane – American Standard System over ten years ago, and it is still working wonderfully. The minor problems we have had, the technician was able to fix them quickly and cost-effectively which made us happy! Our Shamrock Technician was top-notch. Very professional, and he communicated with us on our options. I wouldn’t hesitate to use Shamrock Heating and Air Conditioning again!